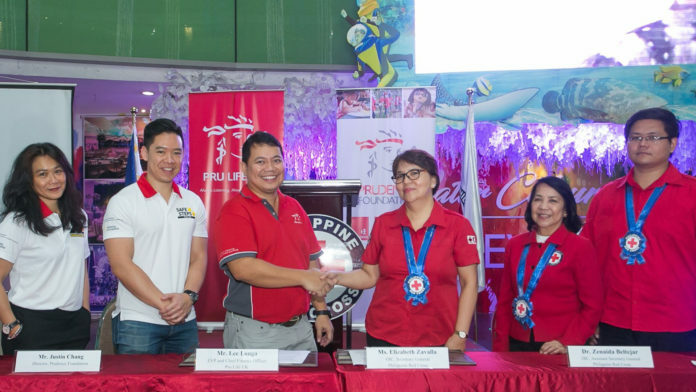 In conjunction with the celebration of World First Aid Day 2018, Prudence Foundation, the community investment arm of Prudential in Asia, has established a partnership with the Philippine Red Cross (PRC) to strengthen SAFE STEPS First Aid awareness in the country. Hosted by PRC, this year’s World First Aid Day celebration in the Philippines focuses on the enhancement of public awareness of the importance of first aid skills in relation to road accidents. According to the International Federation of Red Cross and Red Crescent Societies (IFRC), injuries claimed 4.9 million lives in 2016, 29% of which were due to road traffic injuries. A regionally implemented program, SAFE STEPS First Aid aims to contribute to lowering these statistics by providing people with fundamental first aid information & knowledge, enabling them to be less vulnerable in an emergency situation and help others in need. The program consists of videos, safety cards, posters, and other educational materials covering basic first aid topics, including burns, broken bones, choking, CPR, severe bleeding, and stroke. The SAFE STEPS program also includes SAFE STEPS Road Safety which provides similar materials covering key road safety topics to help the public be safer on the roads. In the Philippines, the partnership with PRC will boost SAFE STEPS First Aid’s education materials reach among Filipinos as the educational materials will be distributed locally in PRC’s offices, blood centers, website, social media pages, and its soon-to-be-relaunched first aid mobile app. Filipino-American humanitarian Dr. Maria Guevarra, one of the ambassadors for SAFE STEPS First Aid, graced the event and shared her experience doing humanitarian work and advocating first aid awareness. Launched in 2017, SAFE STEPS First Aid was developed in partnership with IFRC and National Geographic. The program builds upon the successful SAFE STEPS Natural Disasters and SAFE STEPS Road Safety programs launched by Prudence Foundation in May 2014 and February 2016 respectively with the aim to promote awareness of life-threatening issues in the hope of saving lives and building more resilient communities. SAFE STEPS reaches 250 million people across the region every day through partnerships with the private sector, governments and humanitarian organizations.